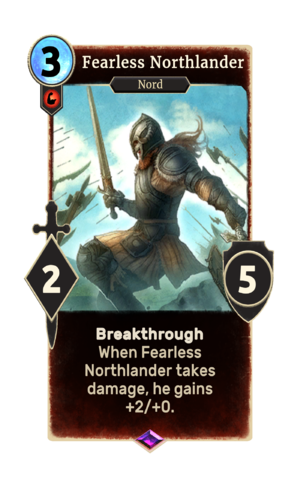 Fearless Northlander is an epic Strength creature card. It is part of the Core Set. This card's ability applies the Battle Frenzy card effect. If the card is destroyed in creature combat, it will enter the discard pile as a 4/5 due to the Battle Frenzy effect applying after death. This page was last modified on 13 February 2019, at 23:47.